Morgan Schneiderlin says he is ready to pen a “new chapter” in his Everton career as he prepares to embark on his first full campaign with the Club. The midfielder made 14 Premier League appearances – 12 from the start – after joining the Blues from Manchester United in a £24million deal during the January transfer window. The 27-year-old Frenchman was satisfied with his first few months in royal blue – but is determined to improve in 2017/18. And Schneiderlin, who represented France at the 2016 World Cup, insists he will benefit considerably from getting a full pre-season under his belt with the Toffees. Asked if there was more to come from him in an Everton shirt, Schneiderlin told evertontv: “That is my target. I want to be the best I can possibly be, to feel good and fresh. “My first six months was good, I was very happy with it. “But now it is a new stage, a new chapter. I want to be better and better. I am not 100 per cent yet but it will come and, hopefully, we will have a better season. “It is very important for a football player to have a good pre-season. Last year I had just 12 days’ holiday and, then, not a good pre-season. “Now we have had time to prepare. After six weeks, you know you still need a bit of time to get back to your best. But by September and October it will be really beneficial. Everton wrapped up their pre-season campaign by sharing a 2-2 draw with Sevilla on Sunday – 24 days after getting up and running with a victory over Kenyan side Gor Mahia in Tanzania. Schneiderlin says the team have made strides in the intervening period, but is promising there is plenty more to come. Talking at Albert Dock, where coaches from Everton in the Community were delivering sessions as part of the Summer Football on the Dock initiative, Schneiderlin said: “You progress physically but you can see we still have work to do. “There is a lot of change in everything: our passing game, the movements our players are making, the defensive side, the pressing side – we still need to make some improvements. “And it is good, because it gives us the opportunity to work very hard, every day. Schneiderlin is eager for the Premier to get going on Saturday. And when Everton clash with Stoke at Goodison, as many as six players could make their Toffees Premier League bows. “They are great people outside the football pitch - and very good players on the pitch,” said Schneiderlin. “We need to get to know each other better every day. That will take time as well but it is very interesting and exciting. “And I do not think the Club will stop. It will be very interesting to see who they bring in, in the last few weeks of the transfer window – then it will be up to us to do the talking on the pitch and deliver the best performances possible. “We are really looking forward to it. We have prepared ourselves for the past five weeks to be in the best shape possible for this season. Him and Gueye seem to have a blossoming partnership. The new Reid n Bracewell? Everton midfielder Morgan Schneiderlin has said that he is looking forward to starting afresh under new manager Sam Allardyce. Schneiderlin arrived at the Toffees in January 2017 and was impressive during his first few months for the club as they went on to finish seventh in the Premier League last season. This season however he has found playing time hard to come by and there have even been suggestions that he is unsettled at the club. In the beginning of November, there were also reports suggesting that Schneiderlin and Kevin Mirallas were sent away from Everton training for a lack of effort, however both players have denied these claims. Schneiderlin played the full 90 minutes for Everton during their final Europa League game against Limassol Apollon and while Allardyce was not present at the game, he is hoping that his performance can earn him more game time. “It’s a game for everyone to show themselves and prove they can play,” Schneiderlin told Sky Sports. Everton midfielder Morgan Schneiderlin has given an insight into Marco Silva’s management and has backed himself to impress this season. The Frenchman struggled for Everton last season and was heavily criticised by fans. 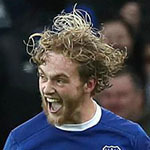 While many expected him to leave the Toffees this summer, a move did not materialise and he is set to remain at Goodison Park. Now, he’s been talking about his new boss Marco Silva as Everton look to challenge the top six once again. Speaking about the Portuguese boss, Schneiderlin praised the open line of communication between him and Silva. He claims that having that communication will help him do the right thing on the pitch. “He’s very attentive to details,” Schneiderlin explained to the Everton official website. “That’s very good for footballers as you need to see yourself after the game and understand what the manager wants from you. “He is very good because he talks a lot and I can feel that I am making progress myself. I need to have communication and know what he wants from me, then it’s easier to transmit that onto the pitch. It’s a normal process and I enjoy that very much. “The manager’s ideas are the ideas that I like. I’m looking forward to this season. Morgan Schneiderlin joined the club in a reported (BBC Sport) £22 million deal from Manchester United in January 2017. After an impressive first six months at the club, last season was a difficult one for the Frenchman. He struggled to find his best form and many Everton fans felt he simply was not trying hard enough for the cause. It left him the main boo-boy of the Everton fans. This season, he has lost his place in the starting XI to youngster Tom Davies, who is currently captaining the side. With Idrissa Gana Gueye a seemingly constant presence, it has seen Schneiderlin make just one-minute cameos in his last two Everton appearances. With reports of new targets and two other central midfielders returning from injury, the Frenchman may soon find himself down the pecking order at Goodison Park. Perhaps, his time at Everton is coming to an end.